Be sure to bring your swimming gear so you can cool off in the rejuvenating pools and feel the healing energy of the falls gushing over you. Depending on which waterfall we visit, you may even get the chance to sluice through the water down a natural rock slide carved out smoothly over hundreds of years by the falls. After our trek we will have a traditional Balinese feast while enjoying beautiful panoramas and the sounds of nature. A little off the beaten track, Sambangan is often called ‘the Secret Garden’ for its lush jungles that hide multitudes of clean clear rivers and majestic waterfalls that cascade down cliffs into cool pools below. 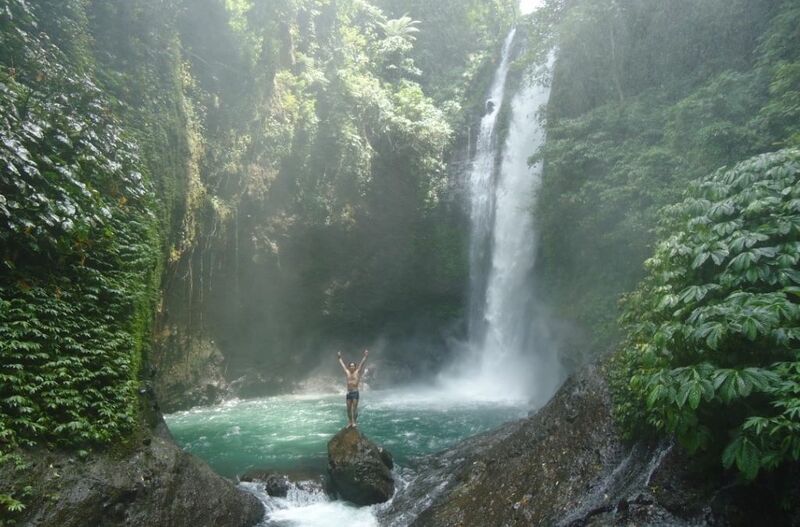 Your trek starts at 9am from the traditional village of Sambangan located in the north of Bali. Here you will see what life is like in rural Bali far removed from the busy tourist areas. Then we will hike past emerald green rice paddies and deep into the forest to discover some of the island’s most spectacular waterfalls. Approximate trek time is 3 to 4 hours. A lush jungle hike with waterfalls, in the north of Bali. From Ubud and Kuta this is a somewhat shorter drive, and the hike is less intensive than the Sambangan area. Often touted as the most beautiful in Bali, this area offers several falls (up to seven depending on the season) within the same area. Approximate trek time is 2 to 3 hours.